As wintertime rolls around, we often end up with a lot on our plates. The holidays are a busy time of year. We may host guests or do some traveling of our own. Plus, if you have children at home, you have to account for their winter break and the accompanying changes to your schedule. Wintertime can be a great time of year, but it’s not always what you’d call relaxing! With all of these variables to consider, two things you’ve probably not been thinking about are yard work and pest control. Believe it or not, though, the winter season doesn’t mean a break from the threat of pests. Sure, you may not have to worry about mosquitoes or wasps -- but there are other winter pests that will see the warm, dry, cozy environment of your home as the ideal place to take up residence themselves. Certain insects and various rodents can present major problems come wintertime, which is why it’s essential to take the necessary steps to prevent them. But how exactly do you prevent wintertime pests? It’s actually easier than you think. All you need to do is ensure that you take a few preventive measures around your home to prep for winter. We’ll talk about each of them below. First, though, let’s take a look at some of the wintertime pests you could be dealing with. Wintertime pests fall into two categories: insects and rodents. While not all insects are a problem in the wintertime, some bugs do tend to migrate indoors come winter. These can include ants, roaches, fleas, and spiders. While you may not see as many of these insects around during the colder months as you do come spring or summer, they certainly don’t disappear -- and they’d love nothing more than to wait out the colder months inside the comfort of your home. Similarly, you’ll find that mice, rats, and squirrels are more likely than ever to make their way into your home once the weather cools down. These critters are looking for a place to nest, and your home will be high on their list of prospects. By taking a few preventive measures, you can keep insects and rodents out of your home this winter. Here’s what you need to do. First, you’ll want to clean out your gutters and overhangs. Gutters full of leaves and other debris are a perfect nesting spot for bugs and rodents. By cleaning them out, you’ll reduce the potential real estate for wintertime pests. 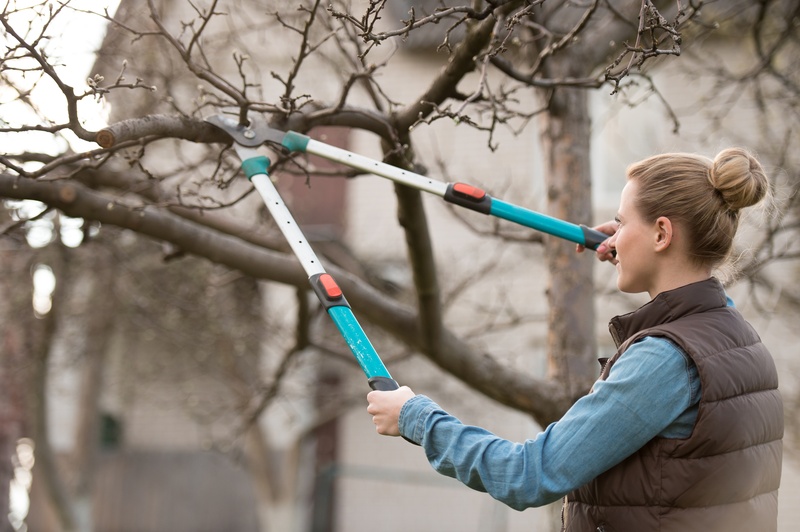 Next, cut back tree limbs, bushes, and shrubs around your home. Bushes growing up against your exterior walls or tree limbs laying on your roof will encourage rodents and insects to migrate from your yard into your home. Removing these cuts off their access points. With that done, you’ll want to cover your firewood and store it some distance from your home. A woodpile is a breeding ground for pests, and the further it is from your home, the better. Next up, check your doors and windows to ensure that they’re sealing tightly. If they’re not, consider repairing windows and/or installing new sweeps on your doors. The better sealed your home is from the outside, the harder it will be for bugs and rodents to gain entry. In a similar vein, it’s important to replace weather stripping if it’s wearing out. Cracked weather stripping can create holes big enough to allow insects inside. Last but not least, go around the outside of your home and check for cracks and holes, particularly around your foundation, windows, and doors. Fill these with foam sealant to keep rodents and insects from making their way inside. By taking these simple steps before the cold sets in, you can keep your home pest free all winter long. If you do find yourself dealing with a winter pest infestation, though, don’t worry: we’re here to help! Our knowledgeable professionals can take care of your winter pest problems in a hurry. Contact Home Pest Control for assistance today! And in the meantime, check out “Winter Pest Control: the Comprehensive Guide to Winterizing Your Home”, for everything you need to know about preparing your home for the winter.